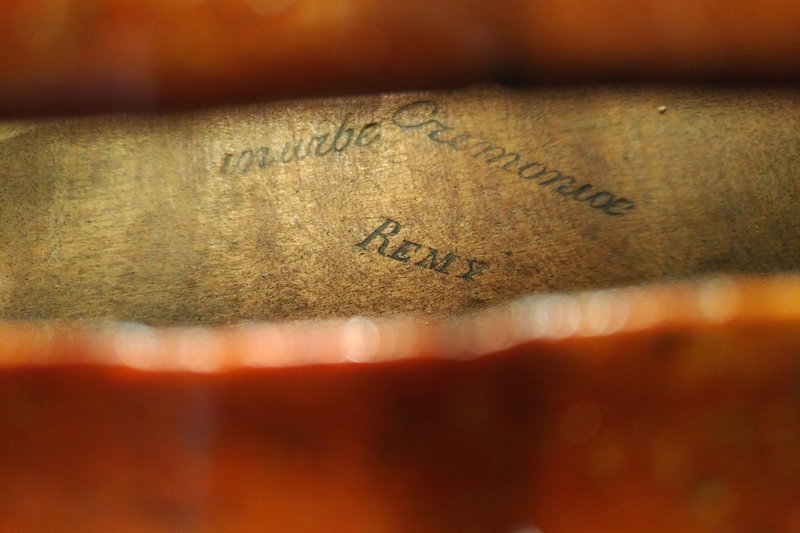 The Remy brand mark inside the body of this interesting historic French violin confirm that it was crafted in approximately 1840 by a luthier who belonged to the renowned family of Parisian master Jean-Mathurin Remy. With its radiant, strong, charming voice and its elegant historic aesthetic, it is a stylish example of the instruments which helped the name Remy establish such a solid reputation in the late 18th and 19th centuries. The medium-grained spruce of the top and beautifully flamed maple of the one-piece back are tone woods of the finest acoustic quality and appearance. A transparent golden-brown varnish gives sophisticated nuance to the perfectly crafted beesting corners and sound holes; the varnish is further enhanced by beautiful anqtiue patina which developed over the course of some 170 years. In keeping with its advance age, this French Remy violin, which has been kept with a crackfree body in premium condition, has only a musically insignificant repair to the pegbox. The restoration specialists at our atelier completely set up the instrument and made it ready to play; its excellent condition. We warmly recommend this violin in part because of its warm and radiant sound, which is darker in the lower registers and has a bright singing voice in higher notes. Recommended for normal and large handed players, due to its slightly larger body size.